The MCP1825/MCP1825S is a 500 mA Low Dropout (LDO) linear regulator that provides high current and low output voltages. The MCP1825 comes in a fixed or adjustable output voltage version, with an output voltage range of 0.8V to 5.0V. The 500 mA output current capability, combined with the low output voltagecapability, make the MCP1825 a good choice for new sub-1.8V output voltage LDO applications that have high current demands. The MCP1825S is a 3-pin fixed voltage version. 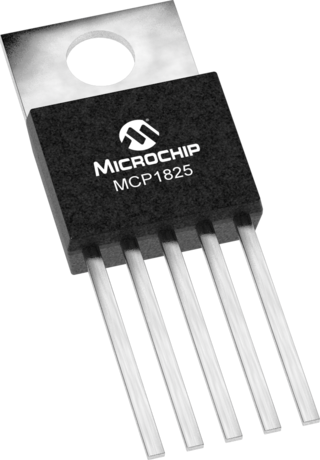 The MCP1825/MCP1825S is stable using ceramic output capacitors that inherently provide lower output noise and reduce the size and cost of the entire regulator solution. Only 1 μF of output capacitance is needed to stabilize the LDO. The SOT223-5 Voltage Regulator Evaluation Board is designed to be used to facilitate the evaluation of Microchip’s voltage regulators or to be used as a standalone voltage regulator board. Jumpers have been placed on the board to facilitate testing of specific voltage regulator parameters. The jumpers may also be used to select pull-up and pull-down voltage levels.